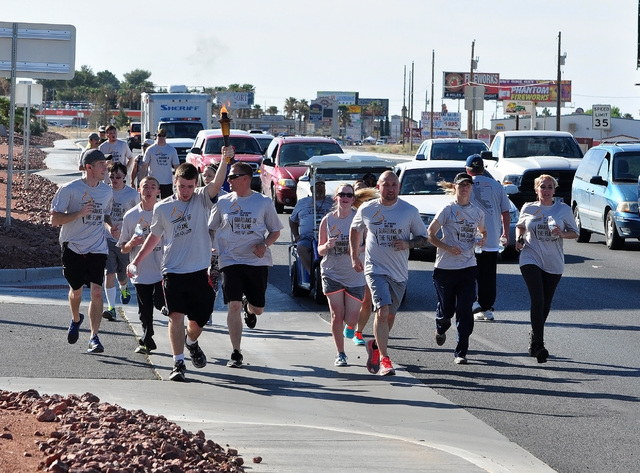 The third annual Nye County Law Enforcement Torch Run was held on Saturday and was smooth sailing due to the hard work of the Nye County Sheriff’s Office. 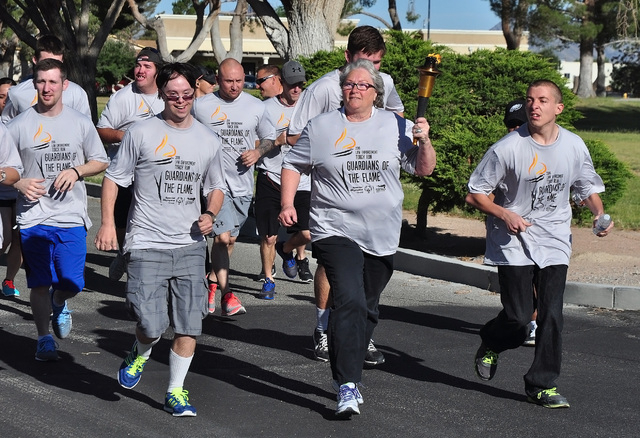 Each year the Special Olympics torch makes its way from Southern Nevada up to Reno where the summer games are held for the Special Olympics on June 3. Sheriff Sharon Wehrly, along with Sergeant David Boruchowitz, Sergeant Kaycee Otteson and 10 deputies made sure the event was done safely and problem free. The deputies ran every step of the 3.3 miles from the Calvada Eye to the sheriff’s office. As the group of runners made its way to Highway 160, many drivers honked their horns and some people even stopped what they were doing to cheer the runners on. The Nye County deputies were the official guardians of the torch while it was in the county and organized the event in conjunction with Special Olympics Nevada. Former area director for Nye County Special Olympics Jim Soltz was all smiles after the successful event. Soltz said the deputies worked hard on the project and even made some great changes to the event. One of the suggestions from the sheriff’s office this year was to have all the athletes run together and this made things a lot better for the athletes. Last year the athletes each ran stages and were not running together and they didn’t all run the three-mile event. In addition, Soltz added, there were more deputies than last year and this made the event even more thrilling for the athletes. Although this was a fundraising event, Soltz said it was more important that it happened. “Yes, we made money, but the smiles the event brought to each athlete was the most important thing,” he said. For Soltz, he was also happy to be alive to enjoy the event. Soltz had suffered a major heart attack before the holidays and has been sidelined for the majority of the year. He is just now getting back into things, but will have to take things slow. Soltz is now more of a consultant and a coach. He plans to coach golf in the fall. The Special Olympics Parent Advisory Board has taken over the running of things in Pahrump. Don Briskey, a parent and coach, runs the committee. According to Briskey, the organization did well this year. “We raised over $3,000 toward our program, that I can tell you right now,” Briskey said.